We all know about the conspiracy merchants who believe that Israel masterminded 9/11 whilst ensuring that its own citizens were not in the building at the time. In Britain we have had a not dissimilar version in the death of Princess Diana. Conspiracy theorists tend to be on the Right, and the far-Right, because it is easier to explain social phenomenon by referring to a hidden conspiracy of a few chosen individuals (usually with the same ethnic make-up) than to lay the blame where it is due, namely in the kind of society we live in. But as Joseph Heller remarked, just because you're paranoid it doesn't mean that people aren't out to get you. There are of course very real conspiracies e.g. the fitting up of innocent people by the State such as the anarchists Sacco and Vanzetti, who were executed in 1927 or the attempted execution of Black journalist Mumia Abu Jamal, framed for killing a cop in Philadelphia in 1981 or indeed the decision to invade Iraq. banks and Hollywood?) the evidence is quite clear. They don't control any banks but they are trying to control and prevent free discourse and debate over Palestine and in particular to erase from Wikipedia any reference to massacres and expulsion of Palestinians. All this is to be done, not openly by stating where they are coming from, but by recourse to the Neutral Point of View rules of procedure of Wikipedia. (ring a few bells? well that is what was done by the supporters of Gilad Atzmon on Indymedia not too long ago who used 'procedure' and 'rules' rather than arguing their case honestly. It is clear that this attempted infiltration by Zionist activists of the editors' group, aided and abetted by an exiting Wiki editor 'Zeq', if it had succeeded, would have meant that Wikipedia would have become merely another arm of Israeli propaganda. The contempt by the Zionist movement for any modicum of freedom of speech and discourse should be no surprise. In Palestine they shoot people who speak out of turn, in the USA they merely demonise them and burn their books or the net equivalent. Encyclopedia Wikipedia to rewrite Palestinian history, Pass off crude propaganda as fact, and take over Wikipedia Administrative structures to ensure these changes go Either undetected or unchallenged. 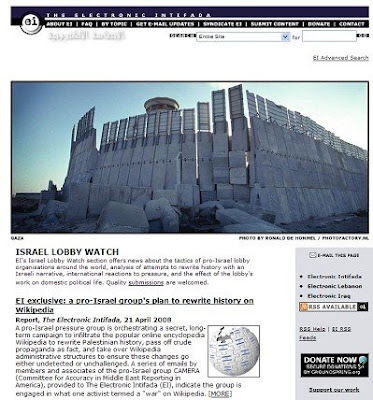 A series of emails by members and associates of the Pro-Israel group CAMERA (Committee for Accuracy in Middle East Reporting in America), provided to The Electronic Intifada (EI), indicate the group is engaged in what one Activist termed a "war" on Wikipedia. A 13 March action alert signed by Gilead Ini, a "Senior Research Analyst" at CAMERA, calls for "volunteers who can Work as 'editors' to ensure" that Israel-related articles On Wikipedia are "free of bias and error, and include Necessary facts and context." However, subsequent Communications indicate that the group not only wanted to Keep the effort secret from the media, the public, and Wikipedia administrators, but that the material they Intended to introduce included discredited claims that Could smear Palestinians and Muslims and conceal Israel's True history. With over two million articles in English on every topic Imaginable, Wikipedia has become a primary reference Source for Internet users around the world and a model for Collaboratively produced projects. Openness and good faith Are among Wikipedia's core principles. Any person in the World can write or edit articles, but Wikipedia has strict Guidelines and procedures for accountability intended to Ensure quality control and prevent vandalism, plagiarism Or distortion. It is because of these safeguards that Articles on key elements of the Palestine-Israel conflict Have generally remained well-referenced, useful and Objective. The CAMERA plan detailed in the e-mails Obtained by EI appears intended to circumvent these Controls. National Public Radio (NPR), frequently criticized by CAMERA for an alleged pro-Palestinian bias, wrote on the Web publication Salon in February 2008 that "as a Consequence of its campaign against NPR, CAMERA acted as The enabler for some seriously disturbed people," citing Persistent telephone threats he received in the wake of CAMERA campaigns. Throughout the documents EI obtained, CAMERA operatives Stress the need for stealth and secrecy. In his initial Action alert, Ini requests that recipients "not forward it To members of the news media." In a 17 March follow-up Email sent to volunteers, Ini explains that he wants to Make the orchestrated effort appear to be the work of Unaffiliated individuals. Thus he advises that "There is No need to advertise the fact that we have these group Discussions." Too happy to pretend, and announce, that a 'Zionist' cabal (the same one that controls the banks and Hollywood?) is Trying to hijack Wikipedia." Strategy is intended to "avoid the appearance of being One-topic editors," thus attracting unwanted attention. Ini counsels that volunteers "might also want to avoid, For obvious reasons, picking a user name that marks you as Pro-Israel, or that lets people know your real name." To Further conceal the identity of CAMERA-organized editors, Ini warns, "don't forget to always log in before making [edits]. If you make changes while not logged in, Wikipedia will record your computer's IP address" -- a Number that allows identification of the location of a Computer connected to the Internet. A veteran Wikipedia editor, known as "Zeq," who according To the emails is colluding with CAMERA, also provided Advice to CAMERA volunteers on how they could disguise Their agenda. In a 20 March email often in misspelled English, Zeq writes, "You don't want to be precived [sic] As a 'CAMERA' defender' on wikipedia [sic] that is for Sure." One strategy to avoid that is to "edit articles at Random, make friends not enemies -- we will need them Later on. This is a marathon not a sprint." and independent pro-Israel advocate. Zeq instructs CAMERA operatives to work with and learn from Jayjg, but not to reveal the existence of their group even to him fearing "it would place him in a bind" since "[h]e is very loyal to the wikipedia [sic] system" and might object to CAMERA's underhanded tactics. CAMERA's takeover of key administrator positions in Wikipedia. or she has not edited or written articles on the topic -- can arbitrate. Hence, Zeq advises in a 21 March email that "One or more of you who want to take this route should stay away from any Israel realted [sic] articles for one month until they [sic] interact in a positive way with 100 wikipedia [sic] editors who would be used later to vote you as an administrator." Once these CAMERA operatives have successfully infiltrated as "neutral" editors, they could then exercise their privileges to assert their own political agenda. In addition, Zeq suggests making deliberately provocative edits to Palestine-related articles. He hopes that editors he assumes are Palestinian will delete these changes, and then CAMERA operatives could report them to administrators so they could be sanctioned and have their editing privileges suspended. glorification of martyrdom in Palestinian society ...'"
In fact, there have been numerous studies debunking claims about Palestinian "hate education," or "glorification of martyrdom" causing suicide bombings (such as Dying to Win by University of Chicago political scientist Robert Pape) though this claim remains a favorite canard of pro-Israel activists seeking to distract attention from the effects of Israel's occupation and other well-documented and systematic human rights abuses in fueling violence. Zeq specifically names articles targeted for this kind of treatment including those on the 1948 Palestinian Exodus, Causes of the 1948 Palestinian exodus, Hamas, Hizballah, Arab citizens of Israel, anti-Zionism, al-Nakba, the Palestinian people, and the Palestinian right of return. Interestingly the CAMERA editors also target the article on the early Islamic period concept of Dhimmi, a protected status for non-Muslims which historically allowed Jews to thrive in Muslim-ruled lands while other Jews were being persecuted in Christian Europe. Pro-Israel activists have often tried to portray the concept of Dhimmi as akin to the Nuremberg laws in order to denigrate Muslim culture and justify ahistorical Zionist claims that Jews could never live safely in majority Muslim countries. murdered by an Israeli soldier in the occupied Gaza Strip on 16 March 2003. As a result of these and other edits Zeq has himself been a controversial figure among Wikipedia editors, suggesting his own stealth tactics may not be working. "We will go to war"
Zeq, however, counsels CAMERA operatives to be patient and lie low until they build up their strength. "We will go to war after we have build our army, equiped it trained [sic]," he wrote on 9 April. "So please if you want to win this war help us build ou[r] army. let's not just rush in and achieve nothing, or abit more than nothing [sic]." Help us grow our team! Please forward this alert to people con1mitted to fair and factual reporting about Israel and the Middle East. Do not forward it to members of the news Inedia. Please use this alert as background for your own unique e-mails, letters and calls. What if you could ensure accuracy and fairness directly in one of the Internet's most visited Web sites, without relying on reporters, editors or publishers? In fact, you can. Wikipedia, the hugely popular online encyclopedia site, can be edited by anyone. The idea behind Wikipedia is that if thousands of well-meaning and informed volunteers collaborate on an online encyclopedia, the result would be more accurate, up-to-date and inclusive than any print encyclopedia could possibly be. The bad news is this allows anti-Israel "editors" to introduce all kinds of bias and error into the many Israel-related articles, even the entry on CAMERA. The good news is, individual volunteers can work as "editors" to ensure that these articles are free of bias and error, and include necessary facts and context. Assuring accuracy and impartiality in Wikipedia is extremely important. If someone searches for "Israel" on the Google search engine, for example, the top result returned by Google would be the Wtkjpediapag~emQn Israel. CAMERA seeks 10 volunteers to help us keep Israel-related entries on Wikipedia from becoming tainted by anti-Israel editors. All it takes to be an effective volunteer is a basic comfort level with computers. Call or email me, and I will train you on how to become a volunteer Wikipedia editor. Thank you all for responding to the latest alert about editing Wikipedia, the online encyclopedia. We know that your time is valuable, and very much appreciate your willingness to spend some of it in the quest for fairness and accuracy on Wikipedia. And considering the truly impressive quantity and quality of volunteers, 11m extremely hopeful that we can and will meet this goal. Let me begin by addressing a couple of questions that some of you asked. * First, while our alert noted that we are seeking ten volunteers, what we really meant was that we want at least ten. I'm happy to say that we currently have about five times that many! * Another common question was: How much time do I need to devote to this project? The easy answer is: As much as you decide to devote. There is no minimum amount of time required to edit Wikipedia. Some of you will only be able to participate periodically, and others will be able to weave this into their daily routine. Whatever amount of time you can spare to learn about and edit Wikipedia will be extremely valuable. Every little bit helps. That said, I'll also point out that improving articlesYYiJJ sometimes require patience and persistence. Fortunately, patience and persistence between 40 people is a good bit easier than patience and persistence by one person. Because Wikipedia articles often change, and are never finalized, we do hope that this will be a long term project. This is a marathon, not a sprint. * The final common query was: Okay, so what do I do? How does Wikipedia editing work? A few of you already have experience editing Wikipedia. For all the others, I'll address the technical aspect of editing Wikipedia a little bit later. But first, 11 11 touch on a few broader, non-technical ideas that are based on my experience with Wikipedia, and on the advice passed onto me by some of the more experienced Wiki editors on this list. Why are we even concerned with Wikipedia? Because Wikipedia is extremely popular, influential, and depends on the participation of fair-minded members of the community in order to work well. What is the problem? It's influential and popular, but it isn't always accurate. Wikipedia has a series of policies and gUidelines meant to ensure that the encyclopedia develops in a fair, accurate and reasonable manner. Unfortunately, these gUidelines are often ignored by editors (even while these same editors loudly and speciously cite these guidelines in order to defend their unfair edits). And as we all know, "controversial" topics like the Arab-Israeli conflict tend to attract an especially large number of partisans hoping to warp the public's understanding of the Middle East. This is happening with many Wikipedia articles, ranging from the article about CAMERA, to the article about Nablu5, to 4/11/2008 various articles about anti-Israel activists, and beyond. It's best to think of ourselves as a collection of individuals and individual Wikipedia editors interested in discussion about Wikipedia. This encyclopedia is intended to be written and edited by individuals –not by groups -- and that's what we'll do. At the same time, by having discussions within our group, we can learn about, discuss, and figure out how to overcome the challenges we each encounter as Wikipedia editors. There is no reason to advertise the fact that we have these group discussions. Anti-Israel editors will seize on anything to try to discredit people who attempt to challenge their problematic assertions, and will be all too happy to pretend, and announce, that a 'Zionist' cabal (the same one that controls the banks and Hollywood?) is trying to hijack Wikipedia. We also should keep in mind that we are part of a larger, well-established, Wikipedia community. And while there are loud and aggressive groups of anti-Israel editors, most of the Wikipedia community is made up of well-meaning people who often don't know much about the Arab-Israeli conflict. It is important that these people -- our potential allies -- understand that we, too, are concerned with thoughtfully contributing to, and improving, Wikipedia. First and foremost, that means having a history of working within the Wikipedia guidelines. (Note that anyone on Wikipedia can view your editing history.) These guidelines are explained on the Wikipedia website, but I will also discuss some of them a bit later. Obviously, it's also important to remain civil when arguing ideas on the Wikipedia discussion pages –even when people inevitably try to provoke you into an online shouting match. It's helpful, if possible, to build relationships. (Fortunately, we now have in this group a built in network of relationships. Nonetheless, it's still helpful to make relationships with established editors, and with super-editors know as 'administrators. ') It's important, after making changes on a Wikipedia article page, to explain these edits on Wikipedia's discussion pages. (I'll address the technical details on how exactly to do this later. For now, let's stick with conceptual issues.) It's very important to avoid framing our arguments in terms of the Mideast conflict, but rather to frame them in terms of Wikipedia's gUidelines. A veteran Wikipedia editor on this list has suggested that, after setting up your account, avoid editing Israel-related articles for a short period of time; or in the very least, try to edit articles unrelated to Israel more than articles related to Israel. This isn't a bad idea, not only to avoid the appearance of being one-topic editors, but also because it would be easier to practice editing, and to learn about Wikipedia, far from the Mideast hornet's nest. You might practice by visiting and editing articles about other topics that interest you. Editing could mean simply fixing typos and grammar, or it could mean adding (footnoted) sentences to these topics. This way, you can gain experience without having antiIsrael partisans jumping down your throat. When signing up for a Wikipedia account, you might also want to avoid, for obvious reasons, picking a user name that marks you as pro-Israel, or that lets people know your real name. Anonymity is an accepted part of Wikipedia. Also, for the sake of greater anonymity, don't forget to always log in before making changes. If you make changes while not logged in, Wikipedia will record your computer's IP address. What now? Now that we've considered some thoughts on Wikipedia, we're almost ready to act! You will soon get via email an invitation to join a Google Group entitled Isra-pedia. Itis there that we'll discuss problematic Wikipedia pages, and how to improve them. You'll also find there a copy of this welcome email, a tutorial on how to sign up for and edit Wikipeida (i.e. those technical details that I avoided discussion in this email), and an Action Items page. Those of you who already have a Wikipedia account and are familiar with the editing process can ignore the tutorial and focus on the action items and the discussion section of our Google Groups page. I look forward to working with all of you. 1. I strohgly suggest people will start with non israel related articles. 2. With all due respect it does not make anay sense to have wikipedia fights in articles about CAMERA. Think who uses wikipedia and for what ? the high school student or the person looking for general information about evenst, people, locations, terminlogy (such as "Right of Return" or II Summer rain operation") . You don't want to be precived as a "CAMERA defender" on wikipedia that is for sure - since they would think you were sent by CAMERA to "repair" the CAMERA entry. You also don't want to apear as only focus and one sided about israel. So edit articles at random, make friends not enemies - we will need them later on. This is a marathon not a sprint. You received this message because you are subscribed to the Google Groups "isra-pedia" group. I need perhaps to interduce myself. I have been working in wikipedia alone for nearly 3 years and learned a lot in the process. All of you will be more succefullif you would apear Neutral as possible. Look we will not be able to fix everything there and there are real importent articles. Nothing will harm your creadability more that if your edits will identify you as tied to or "representative of" a specific organization. I will not get into discussion about how important is the CAMERA article in wikipedia - my view is that CAMERA itself is a very important organization but that the article about in wikipedia is near meanigless (people do not shape their view of CAMERA by reading about it in wikipedia) Since people here have strong views and strong ties with CAMERA my advice is: Stay away from this article for at least 6 month - work on other articles, slowly go into Israel realted articles, in these articles present a view that has to do with Accuracy and for keeping Wikipedia policies in order to make the Wikipedia project BETTER. If you deal with the CAMERA article now you will burn yourself and let them know what you are and your views - which is bad and would prevent you from making friends in wikipedia - friends we will all need in the long run so that one of us (or more) will become administrators. Why it is important There is in wikipedia the ability by an administrator to set significant limits on other editor. in 90% of the cases sanction placed b one administrator are not chalanged at all. they stick. In the issue of Israeli-palestine articles there is now additional restrictions that can be placed by an administrator AS LONG AS HE IS AN "uninvolved administrator". One or more of you who want to take this route should stay away from any Israel realted articles for month until they interact in a positive way with 100 wikipedia editors who would be used later to vote you as an administrator. This is not the only reason but just an example why you should take the marthon view and not rush in for a fight about a not so important article (about a very important orgnization) rememebr we are not dealing here with convincing the exterme antisemite and anti-israel activists (those on discussion boards) We are not dealing with convincing people who share our views either. We are targeting those who look up a term in google and it sends them to Wikipedia or those who look for general explnation about issues. Here is a list of articles I consider highly important- but for now stay away from them also and build your relationship with the wikipedia comunity WIKIPEDIA is a comunity - always keep this in mind. you want to make friends there not enemies. It is not a discussion board in which you will lIconvince" the other side. f1.ttp://er\..v!:i.k.ipedia.. \"Jik.i/Hezbol1ah - notice how it is now "partyu of Allah" (it used to be described in wikipedia as "party of God"
can we do the same from Boston branches? I have access to all these scholarly databases because I teach at Emerson and U.MassjBoston. I don't know whether the public libraries have them all, but I do, anytime you need me to look something up for you. This thread is a continuation of the discussion started in the "Use each other as a resource" thread. Someone there wrote the following. My reply follows: For example wiki says about Deir Yassin: "The Deir Yassin massacre took place on April 9, 1948 when between 107 and 120[1J Palestinian Arabs, predominantly old men, women and children[2J living in the village of Deir Yassin (transliterated Hebrew: Dirat HaYasmin) near Jerusalem in the British Mandate of Palestine were murdered by Jewish Irgun-Lehi force." http://www.hirhome.com/israel/deir-yassin.htm) claims that Milstein does not hold that Deir Yassin was a massacre. So maybe we could put a query out when necessary, and if someone has the book article they will check it out for us? Anyone have a copy of Uri Milstein's War of Independence Vol IV p 273 -- to check if that quote is indeed accurate or if it is taken out of context? Otherwise I have to go through interlibrary loan -- which takes forever. So the cite is more or less correct. The next question, then, is whether this assertion is disputed by other reputable historians. If so, this statement of fact in the lede of the article is extremely problematic. That is, if there is significant controversy about the truth of this statement, Milstein's claim can and should be relayed in the article, but not on its own, as an indisputed fact, in the lede. It would have to be relayed along with opposing points of view. Unfortunately, this is not something I can get to today. If anyone else has reliable resources that they can consult before I have a chance to look into it, please do post your findings here. http://en.wikipedia.org/wiki!U~er:Sli~Virgin were the two most important and infuential editors in wikipedia. Both have added many subjects but also edited israel related articles and took a lot of heat about it. Jay is Jewish, he is most likley an attorney and writes very well. Jay likes things to be done "his way" , he also a great believer about wikipedia project. If you edit in articles he edit. I suggest. you follow his lead or get. out of the way. Learn from the way he done things and cooperate but there is no need to let him know about this group as it will place him in a bind: He is very loyal to the wikipedia system and once even served few years in the Wikipedia supreme court. in a different place he turned a dsipute into mediation: http://en. wikipedia. orgjwiki/v:jikipedia_talk : Requests_for_mediation!Jewish_lobby Jayjg is a fine example how to work in the most due process way. The other side is not doing this and take advantage of their large numbers. we should learn from all of them. Some concerned individual who you alerted has notified the wiki entry discussion page of this information and all hell has within minutes broken loose. One of the named ringleaders of the disnfo group has appeared as have calls to have him banned from editing. That's one heavily watched entry! Yes, I suspect that all hell has broken loose since the Zionists have literally been caught with their pants down. A good scoop, and all credit to Electronic Intifada. I assume that they must have had a plant among the subscribers to the Camera discussion group, just like some of us are signed up to Giyus so we get all the alerts that the Zionists send us whenever anything pro-Palestinian occurs! To order Dr. Uri Milstein's book, go to his web page at "urimilstein.com"
A Zionist Conspiracy to Wreck Wikipedia! The Auntie Simones call it "conspiracy" but we call it a proper plan!! !